Julian Edelman was born on May 22, 1986 in Redwood City, California. He is a wide receiver and punt returner for the New England Patriots of the National Football League. He played college football at Kent State and the College of San Mateo as a quarterback, and was drafted by the Patriots in the seventh round of the 2009 NFL Draft. Edelman is notable for his versatility, having played both wide receiver and cornerback in 2011, and for his punt returns. He holds the Patriots franchise record for longest punt return and the most punts returned for touchdowns; and, as of the start of the 2013 NFL season, the highest career punt return average among active players. Edelman was born in Redwood City, California, the son of Angela (née Gole) and Frank Edelman, who owns a small business. His father is Jewish and his mother is not Jewish. During an NFL Network interview in December 2013, Edelman stated that he identifies as Jewish and that he celebrates Hanukkah, and he wore an Israeli-American flag pin on his hat during the November 2014 Denver Broncos game at Gillette Stadium. After the Pittsburgh synagogue shooting in 2018 that killed 11, he wore special cleats with Hebrew on them to honor the victims. 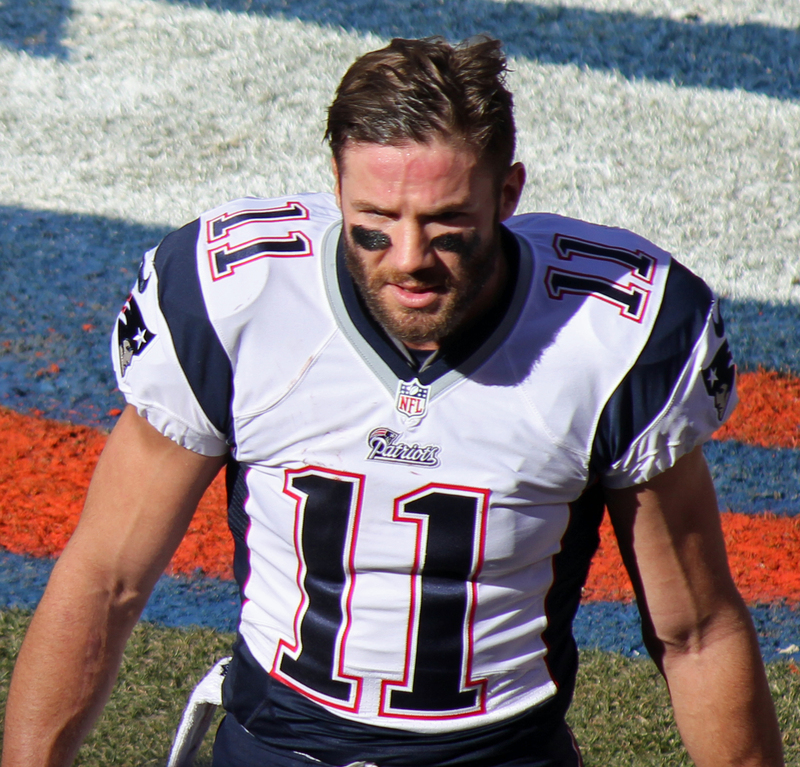 Edelman spent his first four seasons in the league primarily backing up slot receiver Wes Welker, to whom he was often compared as the two have a similar physique and playing style. During those seasons, he primarily played as a kick returner, only seeing the field on offense when the highly productive Welker was injured. Welker left the team after the 2012 season and Edelman seamlessly moved in to his slot receiver role, becoming one of the main targets for Tom Brady. In the 2014-2015 postseason, Edelman recorded a touchdown pass on his first-ever NFL pass attempt in the Patriots' Divisional Round playoff game against the Baltimore Ravens. After receiving a lateral pass from Brady, Edelman threw a forward pass to Danny Amendola, who scored a 51–yard touchdown to tie the game at 28–28. The pass was the longest touchdown pass thrown by a non-quarterback player in NFL playoff history. He was sidelined with an ACL injury for the entire 2017 season, and served a 4 game suspension in 2018 for the use of performance-enhancing substances. Edelman, nicknamed by his teammates “squirrel,” is one of the most productive receivers in post-season history, ranking second overall (behind Jerry Rice) in both post-season receiving yards and post-season receptions. He has played in four Super Bowl games (Super Bowl XLVI, Super Bowl XLIX, Super Bowl LI, and Super Bowl LIII). Against the Seattle Seahawks in Super Bowl XLIX, Edelman led all receivers in yardage with 109 yards on 9 receptions. His touchdown reception with 2:02 left in the fourth quarter was the go-ahead score of the game, putting the Patriots up 28–24 and helping lead them to become the Superbowl champions. In the last three (all Patriots wins), he led all wide receivers in receiving yards, culminating in an MVP-earning performance in Super Bowl LIII when he had 10 catches for 141 yards, more than half of his team's total receiving yardage. He holds two Super Bowl records: career punt returns (8) and first half receptions in a single game (7). Gabe Friedman, “Is Patriots Wide Receiver Julian Edelman Jewish?” Forward, (February 2, 2015).